Spouseman and I got up early on Friday morning, the day after Thanksgiving. We were driving "Mamasita" (mother in law) back home to Selma, AL, from Crawfordville, Fl, where the family had gathered for the holiday. The plan was this: we'd drive to Selma, drop off Mamasita and turn right around and return to Crawfordville to regather with the remaining part of the family, including Light of My Life who would stay and play with her niece and nephew, also known as the cousins. We woke up to one of those fall days that are so pretty they make your eyes hurt. The leaves are still turning in the Deep South and a cold front had come through during the night. Spouseman knows the back, way back, roads of Alabama like the palm of his hand. We took I-10 as far as Marianna, then headed north on the state road up to Dothan and on to Enterprise and Ozark and Troy. There we really headed back into a part of the state with hamlets and crossroads with names like Elba, Opp, Luverne and Brantley, Bolling, Pine Apple and Hayneville. I don't know how long it's been since I saw bales of hay all rolled up and scattered in pastures. I'd forgotten the brilliance of a maple in autumn. So many screened in porches: I can still conjure up the sound of a porch door blamming behind me whenever I see one. There's a sweep to the roofs of old sharecropper homes, a swoop out over the front porch that just makes me ache for a place I never really belonged to but came to know and love. As we came around a bend, the first thing we saw was a simple house--not new, not old, not singular in any possible way, just a country home framed by oaks. But there, right there, out in front, as alive and entrancing as anything can be in the late morning sun, a bottle tree. If you have never seen a bottle tree, you have missed one of my most cherished eye feasts. The concept is simple: put different colored bottles on the ends of branches of a large bush or small tree (crepe myrtle, for example). This one had red, green, cobalt, frosted bottles. Others I've seen are of only one color and if they are of a particular sort, they might be known as milk-o-magnesia trees. The ones I've seen of this variety have an awful lot of those bottles attached to them, I must say... Some folks actually hang the bottles on strings off the branches, so you get the motion as well as the color. But not this one. This was just a basic, real, honest to God, bottle tree. Spouseman's Mamasita was tired and grumpy (bless her 91-year-old self, being pushed and pulled up into a pickup truck at the crack of dawn for a 6 hour drive!) so we decided we wouldn't stop to take the picture till we came back later that afternoon. All of a sudden, those 6 hours of driving, multiplied by two, didn't seem quite so onerous or such a waste of time . Both of us could hardly wait to get back. So we dropped Mamasita off, spent just a few minutes with Spouseman's old buddies, Cosby and Clay and Ken and Pierson, at a hunting camp in Bubba-land, old country boys who were drinking awful coffee and recovering from a morning deer hunt. Ten minutes of "hey y'all" and we headed back out. But before we got clear out of Selma, we stopped to take a picture of one more totem of the South. 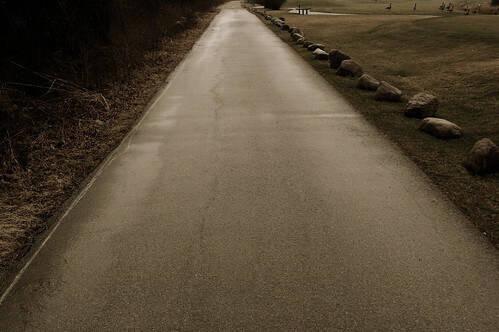 We fairly flew through the back roads, searching out for that place, that magic we wanted to hold for forever. We never found it. Spouseman may have taken a slightly different route. Perhaps in the shadows of a shorter fall afternoon, it passed us by. Whatever happened, I imagine we've both confused quite a few folks down here, when we have gushed and rhapsodized about that tree. I went into Google Images and found lots of pictures, though I was dismayed to read that people are now manufacturing Bottle Trees and selling them. Not a one of them told the story of the tree we saw. I learned something new: that this tradition comes from Africa, that it is believed to be of value in trapping evil spirits and keeping them away from the house. An intriguing new layer of meaning for me. But I have nothing to hold on to in the way of a bottle tree except in my mind's eye. At least we got this picture. I miss the South. Reflection on the readings from Isaiah and the Gospel of Luke appointed for Sunday, November 18, 2007. The two lessons we read today are powerful visions of what is to come. On the one hand we hear our deepest fears put into words : that all will be darkness and loss. And in the next breath, a reminder of God’s most faithful, love-filled promise: that in the end, the Light is stronger than the worst that life can –and will—throw our way. Hearing this reading, I also remembered something very simple about us. We want to know how the story will end. That yearning takes many shapes: raise your hand if you ever shook a Christmas present under the tree. Or poked around in your mom’s closet when it was close to your Birthday? We want to know how the story will end. That yearning is particularly strong half-way through the story, when the newness has worn off, and our destination seems far away. Are we going to be a people of hope or are we to give in to despair? In the Vineyard Program, we have given ourselves the gift of time to stop and listen together for God’s voice, trying to hear our story as God tells it. Kalaidoscopes helped us wonder how things don’t stay the same, no matter how hard we try. We saw that sometimes, when we think we’ve found the most perfect, beautiful pattern ever, one quick move, and it is lost. A necessary loss if we are to be surprised by another even more beautiful pattern than we had ever imagined. We talked about the history of the Kingdom of God with the help of the Fettucia, and then asked ourselves about our family’s timeline and how it fits into that larger story. That helped us look back at where we have been. Then it was time to look at ourselves now. We talked about discernment, and how listening for God’s voice means that we must be willing to sift through, sort out the treasures, the gifts of grace, that are so easily lost in the busy-ness of our lives. Finding those treasures and and letting them guide us into the future was a wonderful opportunity to start looking forward. Finally, last week, Barbara introduced our small, ragtag community to labyrinths. Labyrinths have been a wonderful source of grace for many people of faith across the centuries. A labyrinth is not a maze—a maze is a set of confusing walls and corners that lead to nowhere in particular and are filled with dead ends. A labyrinth is a path that asks us to be careful, mindful, aware of our journey. At times, it may seem that we are making no progress, and instead, actually doubling back to where we had already been. 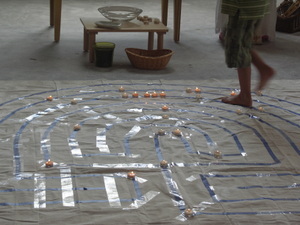 To experience the full richness of the labyrinth, we have to be willing to follow a path that is not of our own making. We can take short-cuts if we want, but we will never know what we missed. And when we finally arrive to that beautiful center, as much as we may want to stay there, we are compelled to go back out—hopefully carrying with us a new-found sense of peace and charity, because we have been in the presence of God. The labyrinth reminds me a lot of the Eucharist. The people of All Saints know a lot about journeys and walking—our very first building, was moved here from Vero Beach. And now, just 4 years away from our 100th anniversary, we are on the move again. I suspect that at times it has felt like we were in a maze. But as I look around this beautiful holy space, and this circle of hope, I believe that we have been making a journey of labyrinth that is inviting us to deeper relationship with God both as individuals and as a community. So what makes a journey one of labyrinth? Last week, when our families were discussing labyrinths, Kayla said the following: “The Labyrinth is like your relationship with God. The beginning of the Labyrinth is your baptism…as you grow in your relationship with God, you travel through the labyrinth. Making decisions and standing up for your relationship with God leads you down the path through the labyrinth.” Our children teach us so much. And there is no single decision that will get us from the entrance to where we are going—there are thousands of small, and sometimes huge, decisions that are required of us. Unless we keep that truth very clear in our minds, we might end up thinking we are still moving forward when in fact we are on a treadmill, racking up the miles and not getting anywhere. What keeps us stuck? Sometimes, there are things about us that it is time to let go of (break a twig). Sometimes there are parts of ourselves that must be tended to and allowed to grow (plant a seed). And sometimes, our very light has been buried under a bushel and it is time to let it shine bright and beautiful again (light a candle). It also helps to stop and remember what we believe. In the Episcopal Church, the most essential affirmation of our faith is simply this: that in our Baptism we were received into Body of Christ in the name of the Father, and of the Son, and of the Holy Spirit. We were empowered and called to be salt and light in the world. When we come together for the Holy Feast each Sunday, we get so used to saying the words of confession and of the creed, that they loose their power to transform and bring us deeper and deeper into God’s love. Yet they are essential to our journey towards God. We are going to spend a few minutes in silence. If there is a twig you are ready to break, a new seed to plant, or a light to allow to shine more brightly, please join me in this work. This will be our confession this week. And when you are done, as a statement of your faith, dip your hand into the cool water of New Life in the Risen Christ, and remember that we are baptized in the name of the Father, the Son and the Holy Spirit, sealed by the Holy Spirit and marked as Christ’s own for ever. Simple acts of faith, allowing us to draw closer to that quiet point that is the center of all life. Last night was Bible Study at the Centro. The gang had a surprise belated birthday party for me--the really dense, rum soaked, almost overwhelming cake that is used for special occasions in Colombia, gifts, and the very best: they sang a stirring rendition of "Las Mañanitas" to me, slightly off key because our two alcoholic bums in residence were a little tipsy in my honor. Then we read the wonderful passage from Job 19:25-27: "then in my flesh I shall see God, whom I shall see on my side, and my eyes shall behold, and not another." and talked about what it will be like, standing face to face, with our Redeemer. I came home happy. When I woke up on Thursday morning, the first thing I heard was that Broward County was under a tropical storm warning. I had been very flip earlier in the week, glib about the fact that I was just as glad that high winds and squalls would keep us from doing much trick-or-treating with LoML. In fact, when it was time to go out to do the deed, LoML scared her own self enough, dressed up as a skeleton pirate, that we visited three houses, and gladly closed Halloween down for another year. Now it was the day after and I lay in bed hearing that forecast, fully aware that inertia has been powerful this year and there were all manner of possible projectiles strewed across our deck and yard. The last thing I wanted to do was yard work! There was more though. I could hear that LoML had that very croupy cough of hers again, the one we heard a lot after she first came to us from Mexico. The one that goes with asthma. At the same time, my friend, Archangel, had had another seizure at work on Wednesday, and now his boss didn't want him back on the job--too high a safety risk. I'd promised I'd find a way to get him in to see a neurologist that day to see if he could get on anti-seizure meds and go back to work. Hanging over all that was the awareness that our Sunday School program this Fall is a complete improvisation, a faithful effort to lead a small core of families through a process of preparation to start a new Eucharist on Sunday mornings. This plan attempts to explore new ways of doing "multi-generational liturgy" The work of Caroline Fairless at Children at Worship has been great for helping me distill and then articulate what was once a vague and largely intuitive sense that our traditional liturgies at All Saints, lovely as they are, leave a lot of folks out. I still needed to get this week's lesson plan firmed up and start making plans for next week when I will be out of town--all of that while still honoring my commitment to take Friday off. I had a big knot inside me all day. I got my friend to the neurologist and in the process also got some important information about a clinic that offers very reasonably-priced primary care to Latinos. My child got back on asthma meds and even got a flu shot. The lesson plans came together, at least for this week, and some new ideas for next week began percolating. I even got to have a lovely meal at our favorite special restaurant in town. But the knot was still there. You see, at CREDO, the conference I attended three weeks ago, the time I had for silence and sorting, I was reminded of a wonderful little maxim from Colombia: "the person who tries to hug too much squeezes too little". Here I am, trying to do new church development along two different lines, with two very different sets of people, all at once. I love both sets of challenges. But I am also the mother of a child with significant special needs, and a husband who has worked incredibly hard as a priest for over 20 years and is tired. And, much as I try not to think about it these days since things have sort-of stabilized, I am the daughter of a person dying of cancer. The knot I had been carrying all week, the one that manifested itself as a muscle spasm along my shoulder blade, would just not go away. The fibers of my being all tangled and knotted and tight kept trying to speak and I kept getting busier and busier and busier instead. 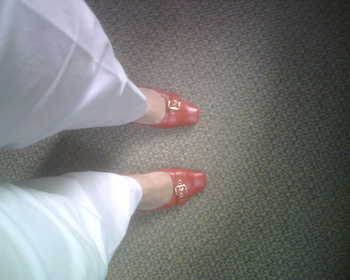 Early on Friday, I prayed and reflected on my week. When I was away, at a healthy distance from my life, when I spoke Spanish for almost the entire time, and listened to other priest's stories of doing Hispanic/Latino ministries, I was called, compelled really, to make sure that I give that ministry the nurture and tending it requires. I came back home brimming with ideas that we've even started working on--fund raising plans and an evangelism event that I'm really excited about. I had it all figured out, about what I need to do and be. But more and more kept getting added on as I "re-entered" my life. I could not sift fast enough to keep things sorted and in their proper perspective. I'm glad I did stop for that short time of quiet on Friday. I know now that I won't get there all at once, but I am determined that the work I need to do with the new liturgy on Sundays is one of calling and empowering others to bring this new ministry to fulfillment so I can respond faithfully to the sense of call to the Centro. On Friday afternoon, Spouseman had a meeting with a member of the parish who we have hoped could make a contribution to the capital fund for the new buildings at All Saints. As he was preparing for that meeting, I finished taking care of the last details for the liturgies of this weekend. All Saints Day and the Feast of the Faithful Departed are very important in the Latino culture. At least this year, I am finding that death and transformation in faith--the essence of vocation--are inextricably linked. I found a piece to sing after communion called "Into Your Hands" that includes the phrase, "if we would live, we must be willing to die, into your hands I commend my life." Sifting, discernment, sometimes feels like dying to me, and all my instincts for survival kick into highest gear, making me more truculent, less open to light and hope and love. That piece nudged me further into trust. Then I went off to my Pilates class, at peace with the fact that I had not had the day off that I had wanted but had experienced some renewal, nonetheless. The stretching and strength exercises I did really helped and for the first time in days, I could turn my head without pain. When I got home I found out two things. The donor made a hugely generous commitment to the new building fund. She also wrote a check for $50,000 for me to use in support of the ministries at the Centro.